Consultation de Médecins, 1760. Louis-Léopold Boilly, [Recueil de grimaces], G. lith. de Delpech. Consultation de Médecins, 1823. Louis-Léopold Boilly, [Recueil de grimaces], G. lith. de Delpech. 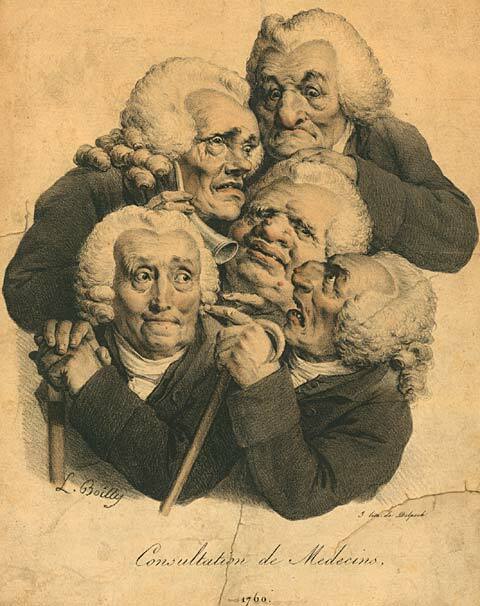 Louis-Léopold Boilly has a second lithograph entitled, “Consultation de Médecins, 1823.” Like the 1760 “Consultation de Médecins” and the next image of hunchbacks, this is a print from Boilly’s most popular series, “Recueil de grimaces” or “Collection of grimaces.” Containing over 90 lithographs, the series was published between 1823 and 1828. 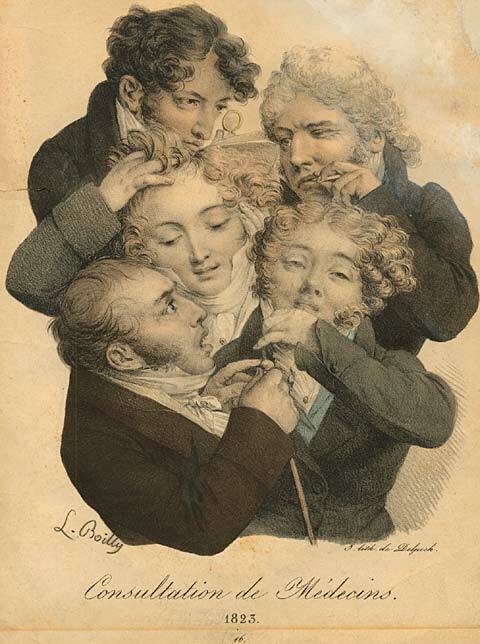 The members of this tightly grouped quintet, shown in 1823, are at the prime of life unlike Boilly’s aged medical consultants of 1760. These consultants are all young, but distinctive in their facial expressions. The physician in the lower left looks decidedly dismayed while the man next to him seems dreamy or even drugged. The two at the top appear to be engaged in academic pursuits. The magnifying glass indicates a scientific approach to medicine, and the gentleman in the upper right has a contemplative look as if he were trying to come up with a solution to a troubling problem. The viewer is left to decide if Boilly is making a political commentary about France in 1823, but could it be that the more things change, the more they stay the same?